M.,T., & Th., 12:00 p.m.–8:00 p.m.
Monday and Wednesday 3:00 p.m. – 6:00 p.m.
Tuesday, Thursday, and Friday 8:00 p.m. – 9:00 p.m.
Ingrando Park has been a center for activity in Southeast Houston since 1944. Its broad acres of tree-shaded picnic areas, ball fields, and the Ingrando Park Community Center offer recreation and relaxation for local residents, and plenty of room for tossing a ball and walking the dog. On August 23, 1944, the City of Houston purchased 14.866 acres along Plum Creek from Malcolm and Nellie Sprague of Campbell, California, for $14,866. This property became Southmayd Park. 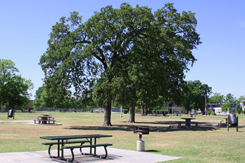 In 1994, the leadership of the Pecan Park Civic Club and Council Member Gracie Saenz pushed for the acquisition of an additional 1.3915 acres available next door to the park. An ordinance approving the purchase for $96,129.25 from the Will Frank Johnson Trust and the estate of Eunice H. Johnson was passed on September 18, 1996. On September 22, 1971, a resolution from City Hall renamed Southmayd Park after Frank and Jennie Ingrando. The couple’s foundation donated $100,000 to improve Ingrando Park, resulting in new picnic facilities, a new playground surface, walks, landscaping, and new lighting for ball fields. A Texas Parks and Wildlife Department matching grant also went into this project. 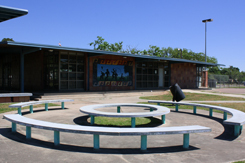 TPWD grants were also tied to a 1989 project that improved wheelchair access ramps to Ingrando Park. In June 1993, Park Bond funds were used to improve lighting at ball fields and tennis courts in 8 H.P.A.R.D. parks, including Ingrando Park. 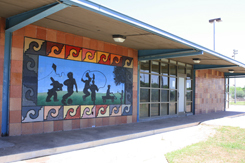 Further renovations were undertaken in 2000 and were completed in 2002, resulting in enhancements to the community center, pavilions, and ball fields, and the addition of a new soccer field. 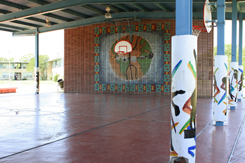 Today, the residents of southeast Houston enjoy many facilities at Ingrando Park. A community center, a multi-use pavilion, basketball courts, 3 ball diamonds, and a .59-mile walking trail round out the park’s amenities.